A loyalty program should never be an afterthought. It should be a natural component of your site that effortlessly enhances your brand identity. Whether you’re new to the loyalty game or not, be sure to always take a step back to assess if your loyalty program seems like a natural feature of your site. Is it easy to locate? Does it show off what makes you unique? Is it memorable? Waterdrop has paid careful attention to their loyalty page. The look and feel of the page is synonymous with the website’s overall branding. The colours are fresh, the imagery is light and the language evokes a feeling of inclusivity. Overall, it feels like a natural part of the on-site experience. On the loyalty page itself, everything, from the actions customers need to take to earn points, information on the free gifts they can acquire and the explanation of the tiers, is communicated clearly. Tea brand, Harney & Sons, has its branded loyalty page upfront on their site to engage both existing members and new shoppers. The brand’s distinct gold colour – seen in the logo – is incorporated into the buttons on the loyalty page. Harney & Sons have also made their loyalty page fully interactive. This means that customers can carry out on-site behaviour, such as inputting their birthday or following the brand on Facebook, without being directed to another page. This keeps customers on their website for longer. Ready to find out more about the integrated loyalty program? Access a quick video tour. 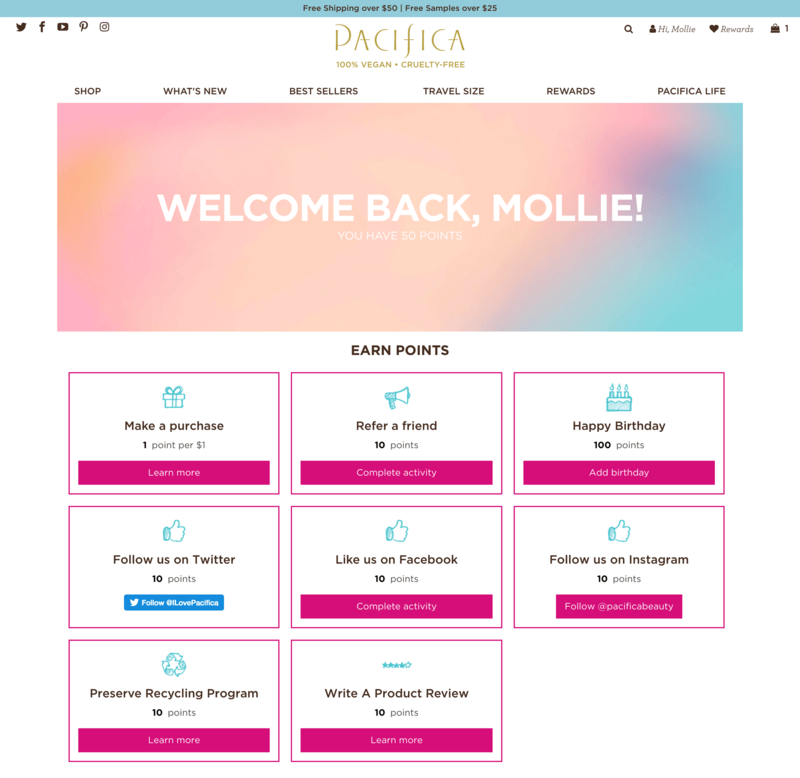 Pacifica Beauty is an excellent example of an easy-to-use and navigable loyalty page. Their aptly named program, “Girl Code Points”, blends effortlessly with the look and feel of the site. Using the same icons and colour scheme that appear on their site, they have made sure that their program is an essential feature of the site and a natural part of the customer experience. Pacifica Beauty also displays its loyalty program across the whole buyer’s journey. When a shopper hovers over the cart icon, they can see their point balance for the items in their cart. 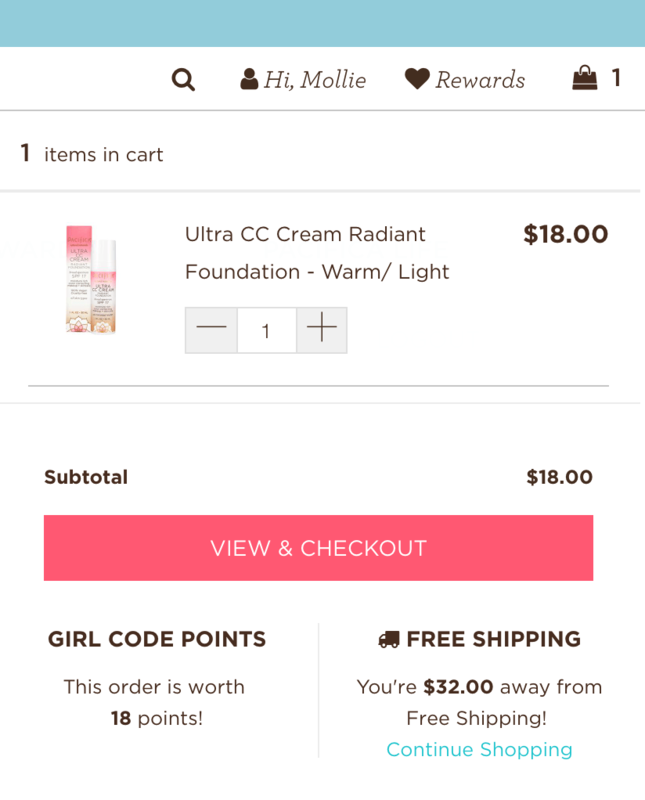 And, when they click to view their full cart, they are shown the point value of their order alongside how many points they still need to redeem before they can claim a free gift. This way, customers are incentivised to increase their basket size. Once the customer is nearing the end of their purchase journey, Pacifica Beauty also displays a slider in the checkout that allows customers to apply the discount they’ve earned from their loyalty behaviour. This keeps the loyalty program at the forefront of the customer’s mind, from start to finish. 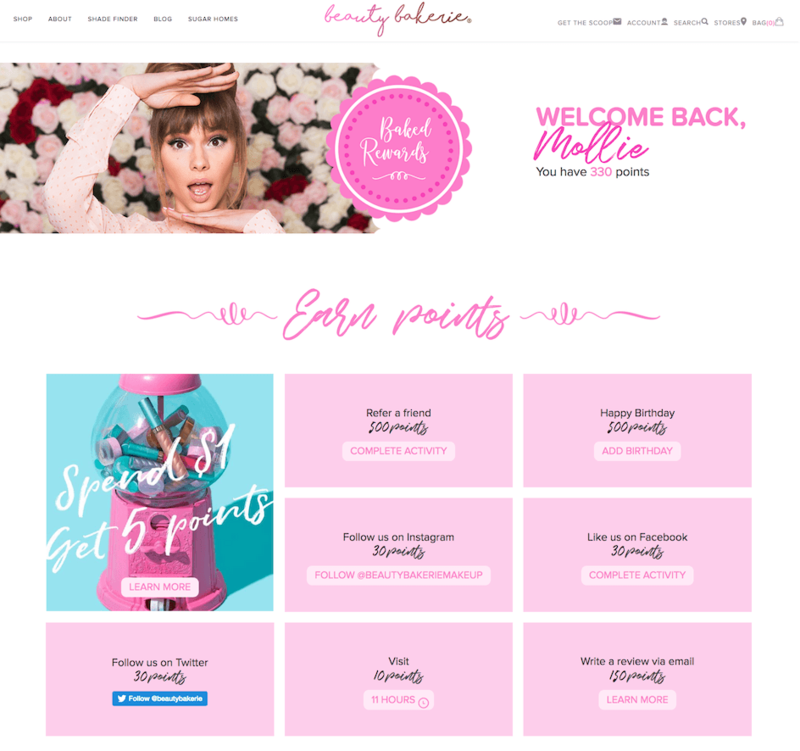 Beauty Bakerie has taken a distinct approach to their loyalty page by making it the sole focus of the member page – and directing members straight to it when they log in. 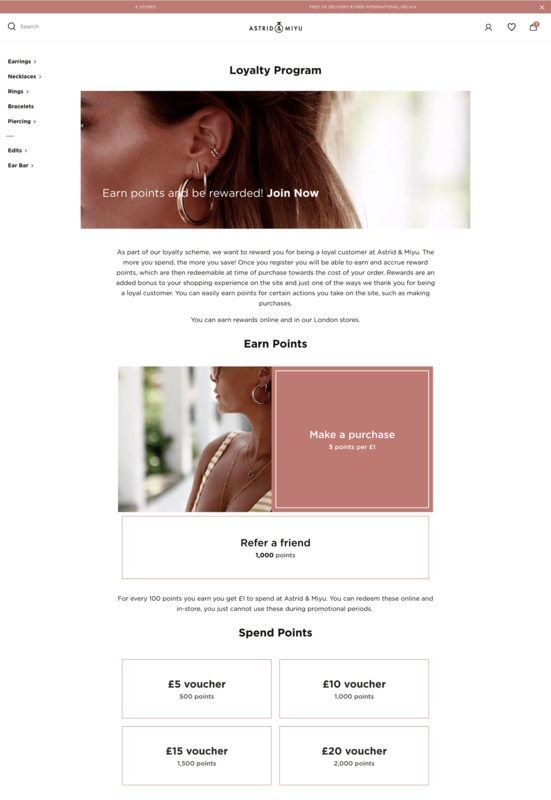 This means that new users who sign up to the loyalty program are immediately shown more ways to earn points before they start exploring the rest of the site. By naming the loyalty program “Baked rewards” and their top loyalty tier “Cake Boss”, Beauty Bakerie are subtly using their program to enforce how their brand is inspired by sweet treats. They use their loyalty page as another way to communicate their brand story. Alongside this, the typography and colours they use on the page matches perfectly with the rest of the on-site experience. 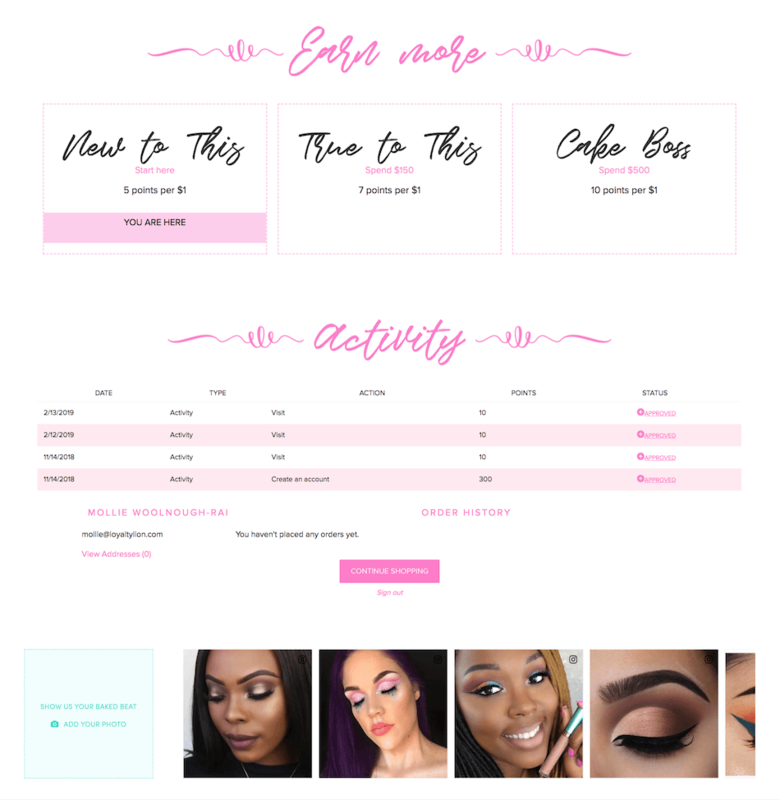 When a user logs in, Beauty Bakerie has also made sure that the loyalty page is personalised to the user. The customer’s name and point balance are displayed in the header, showing that the brand cares about their customers on a personal level, beyond just the money they spend. Jewellery store, Astrid & Miyu, take a similar approach to Beauty Bakerie. Their loyalty page is the main place members are directed to when they view their profile. The first thing they see is a personalised welcome back message and carefully branded loyalty modules clearly stating the activities the customer can take to earn rewards. There are many ways to make sure that your loyalty page acts as a natural part of your online store experience and an extension of your brand. All in all, your program should enforce your overall brand identity, attract the attention of your shoppers and be memorable. Get Started! Want to find out more about the integrated loyalty program? Submit your details to access a quick video tour.